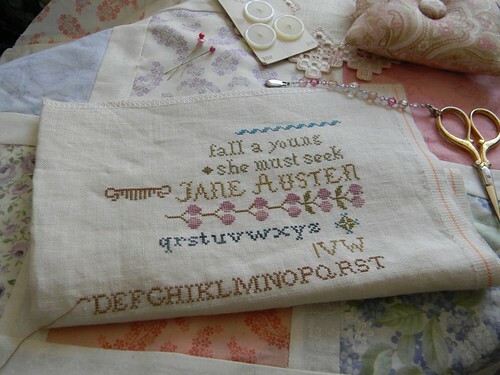 Some Austen themed finishes. 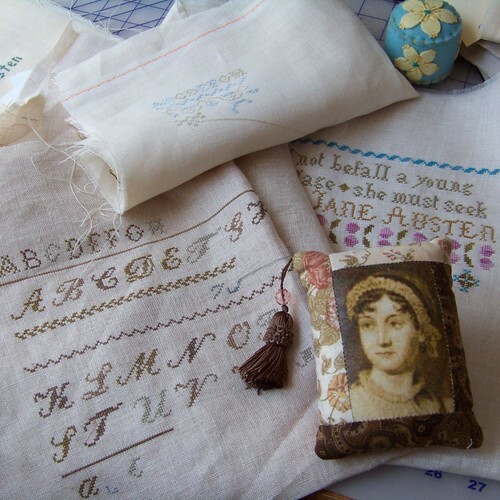 I’ve listed all these patterns on the Jane Austen Projects Page at the webshop, there is a free bonus offer with the Northanger Abbey design. 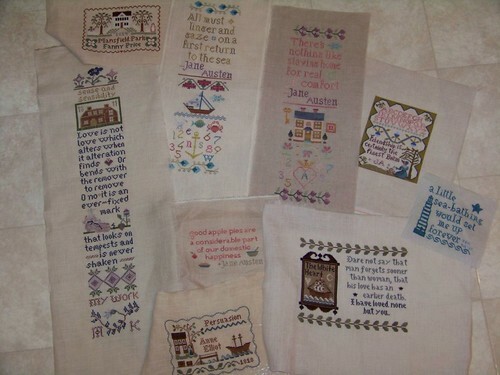 Most of these are from The Sampler Girl, one of them is a recent free design you can find here. 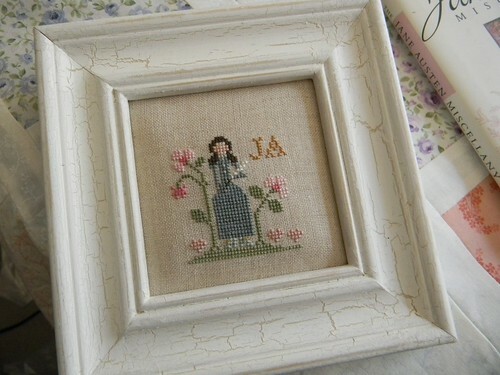 The other, which I converted into a little Mansfield Park keepsake is from Little House Needleworks. I have 6 or 7 other finishes in the works but really need to spend a fair amount of my time finishing up the unpacking. I’ve pulled out all the essentials, now it is a matter of sorting through things that don’t really have a place and deciding if they are treasures I shall keep or if I should add them to the Good Will pile. Jerry is wrapping up a 2 month out of town project and will possibly be on a local project for the next little while. That would be wonderful! Tyler likes his new job very much and Amber is taking a week’s vacation in Montana. The pool is open but we haven’t been yet, still so much to do around here and it hasn’t been super warm. I have been taking so many pictures I think I have more things saved than I can possibly blog about for the next 3 months, I’ll just keep posting. 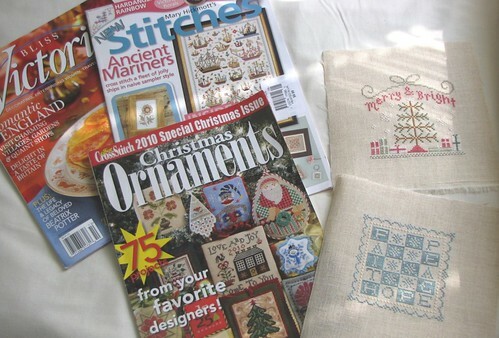 I rarely buy magazines, more like – I never buy magazines. For some reason I’ve bought 3 recently. 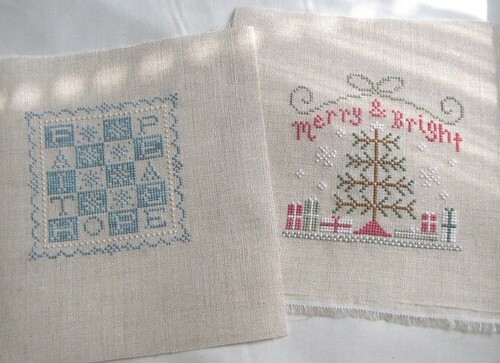 I found all of these enjoyable and had to stitch my 2 favorite ornaments right away! 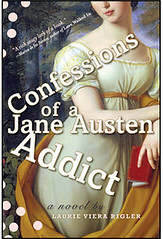 I’ve also finished two books. One of them I loved and the other I didn’t like at all. 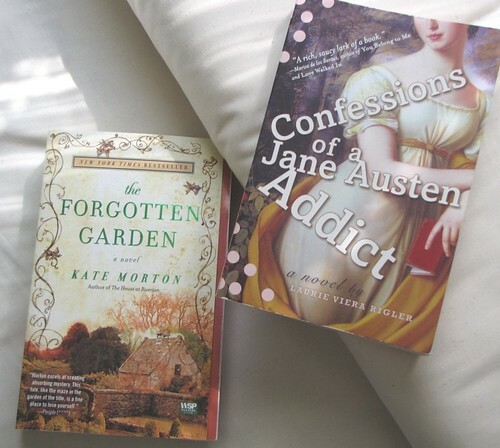 I highly, like right up there with The Guernsey Literary and Potato Peel Pie Society, recommend The Forgotten Garden by Kate Morton. I haven’t enjoyed a book so much in a long while and I look forward to reading more of her books. 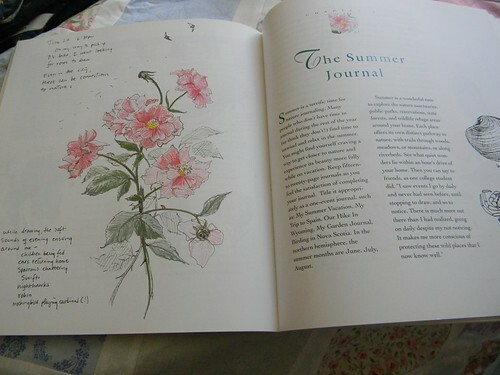 On the other hand, I’m sorry I took the time to read the other book. 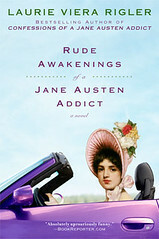 I was planning to read 2 books by this author for the Everything Austen Challenge II, I will not be reading the other one. Aside from not enjoying the story and disliking the main character very much, I don’t like the ‘f’ word in books I read, movies I watch, music I hear, or any other place else you can think of, it honestly jars my senses. 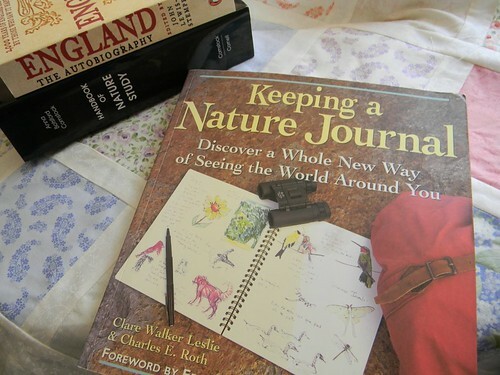 I seriously thought about tossing this book in the trash the first time I came across the word – I wish I had. 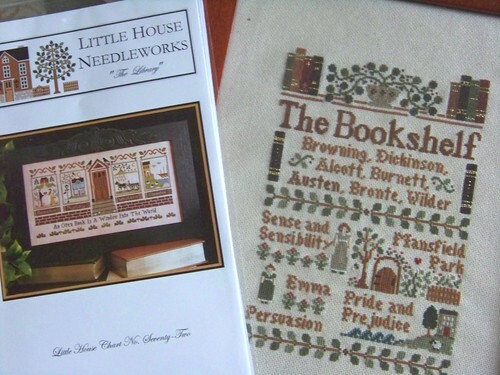 Because it is impossible for me not to feel like a horrible meanie writing this, I will gladly tell you that the author says some very good things about the pleasure of doing needlework. 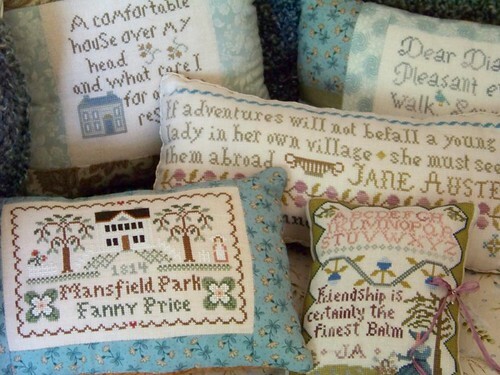 Not sure what I’ll read next (aside from the history books I always have going) I’m listening to the first book in the Cottage Tales of Beatrix Potter by Susan Wittig Albert, enjoyable so far in a mindless sort of way. 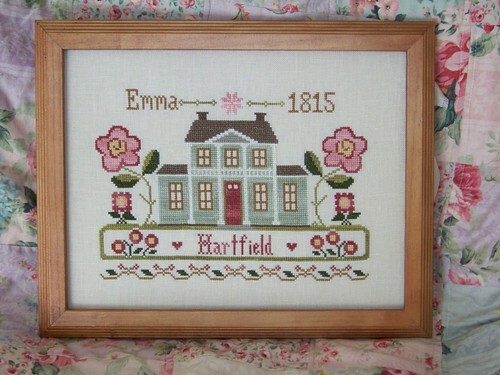 I’m hoping to pick up The House at Riverton (Kate Morton) if I can find time to stop at Borders. 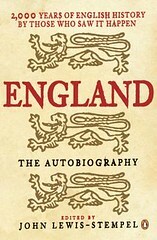 If you are over at Goodreads I try to keep my reading shelves updated and I’d love to connect with you there. I’ve come up with 3 books and 3 projects. 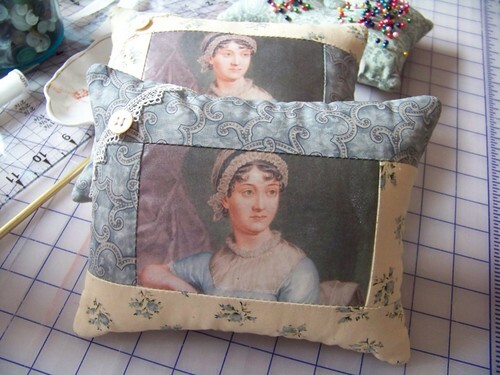 They aren’t necessarily Jane Austen themed, but most definitely Jane Austen inspired. 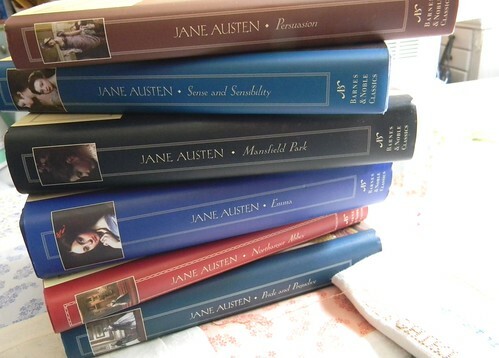 I watch the available DVDs frequently and read her novels on a regular basis so they aren’t on the list, these are the things I plan to do in addition to those JA things I do already. 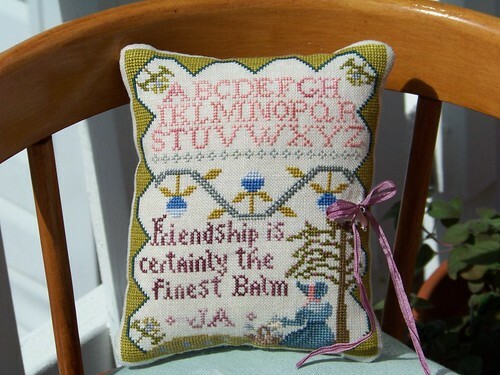 PS – Starting tomorrow there will be a webshop special for Independence Weekend, stay tuned! Last year I signed up for the challenge and although I didn’t complete all I hoped to, it was nice being part of a community of JA fans doing JA things. I’m planning to take part in this year’s challenge, if you’d like to sign up too you can find details here. 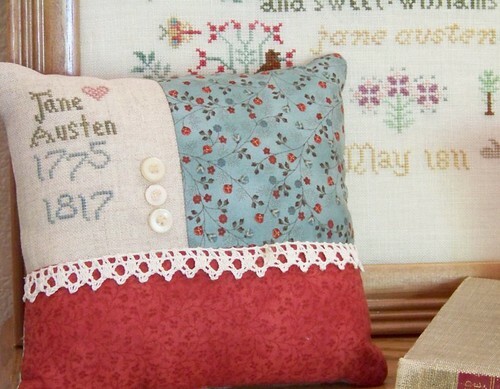 I’m working on my list, it will include reading, quilting, and stitching. 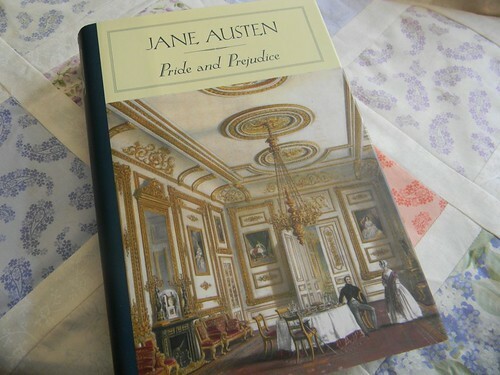 PS – I am keeping up with the P&P (without zombies) read along! PPS – Blueberry Crumb Cake recipe here. 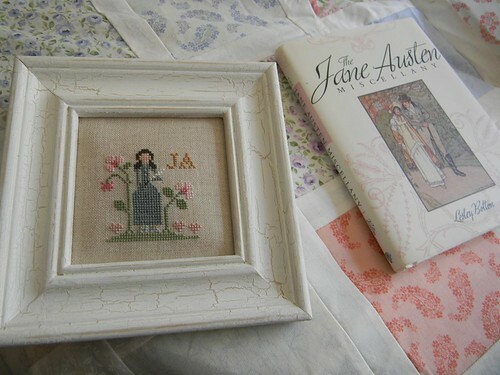 My Jane Austen sampler wall has an addition. 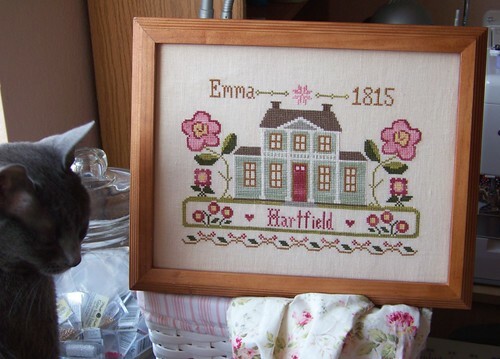 I’ve made some tiny changes to Rose Hill Plantation from Little House Needleworks to make an Emma Sampler. I was inspired by the newest adaptation from the BBC. 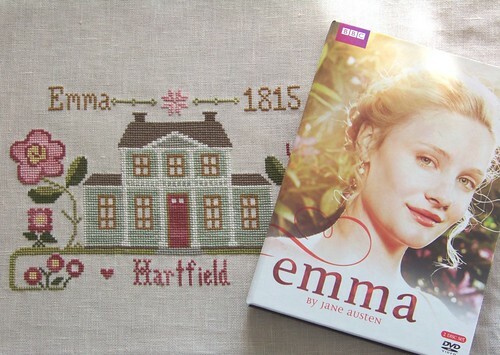 This movie is full of light and the colors of this sampler made me think of Emma’s wardrobe and home in the movie. The architectural style is all wrong but with the big flowers it’s a bit whimsy anyway. 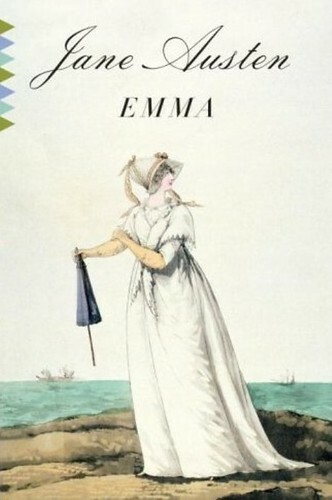 I will admit that Emma is my least favorite Austen novel, yes I even like Northanger Abbey more than Emma. This film version is very enjoyable but I was interrupted at least 19 times while watching, interruptions that required me to pause the DVD. I’d like to watch it again, without pausing, sometime soon. 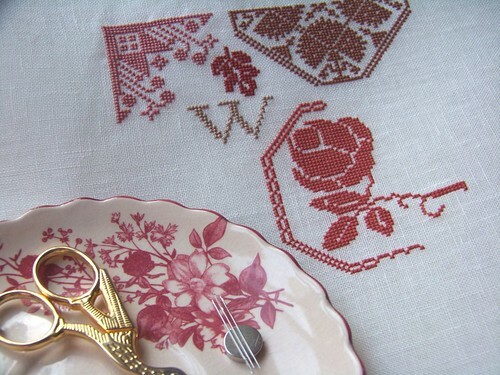 I have also made a tiny start on Rose Quaker by Stickideen von der Wiehenburg (see the ‘W’ for Woodhouse), I’m using 40ct linen that I’m not in love with color-wise. I think I’ll try distressing this when it’s done. 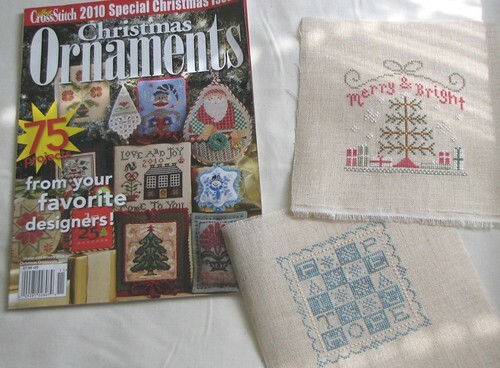 I’m using the DMC threads as listed on the pattern – so far. 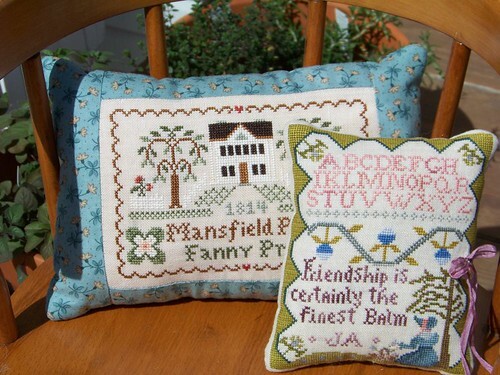 It’s been a while since the challenge started but I’ve been enjoying extra Jane stitching and reading when I can. 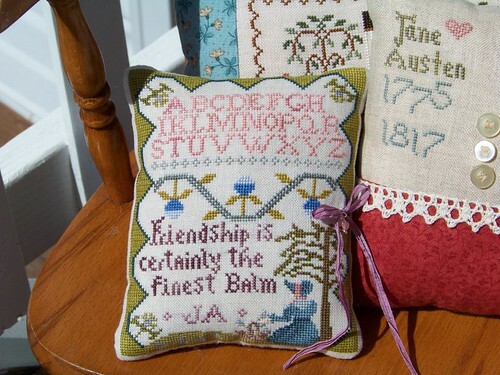 After doing a bit more stitching on the On Travel with Jane Austen sampler I’ve decided to start over on 40 linen – I just don’t know where I would put a larger finish. 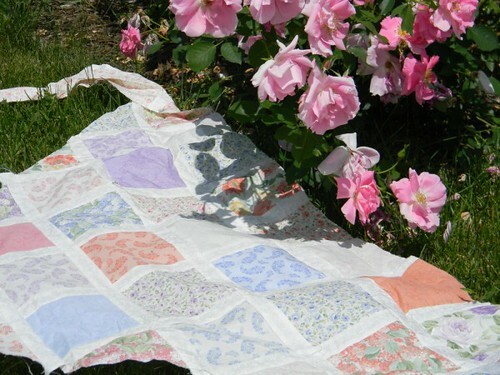 I’ll make a pillow from larger bit I have finished. …and I have been reading. 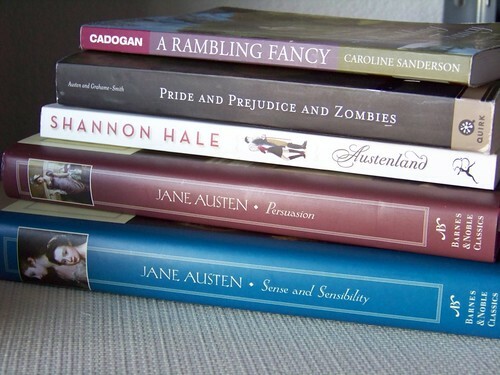 I think on my original ETAC post I said I hoped to read three Jane Austen-ish books. 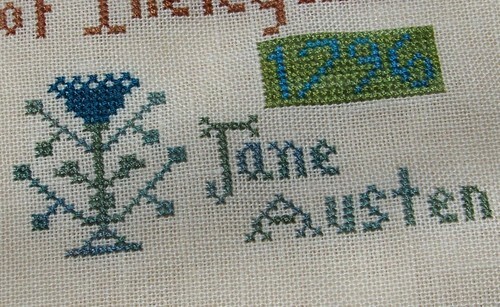 I’ve finished that part of the challenge plus a bit but my poor JA sampler wall still only has one occupant. A finish!! 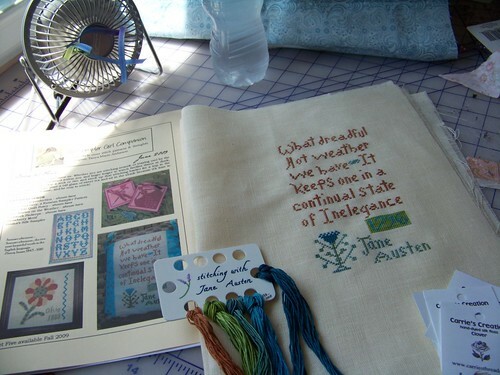 Jane Austen on the Weather, this is from The Sampler Girl’s Companion Booklet #4. 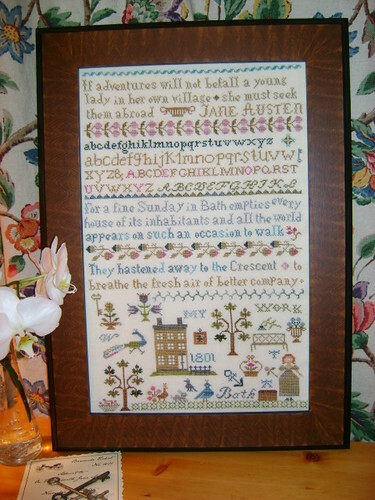 I stitched this on light sand Belfast Linen using Carrie’s Creation Silks. 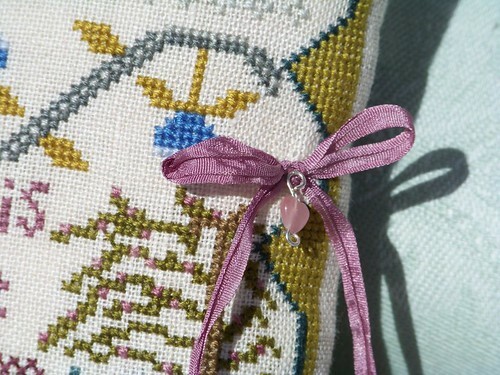 I think these threads are beautiful, and by the way, it is dreadful hot here today! 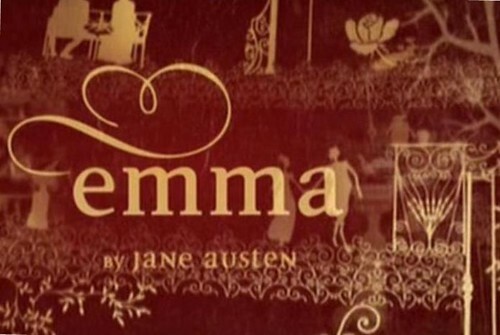 This is the perfect kickoff for the Everything Austen Challenge! 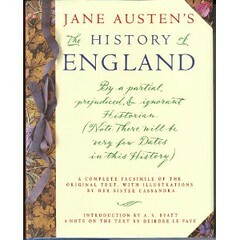 For the challenge you choose 6 Austen ‘projects’ you would like to complete by January 1, 2010. 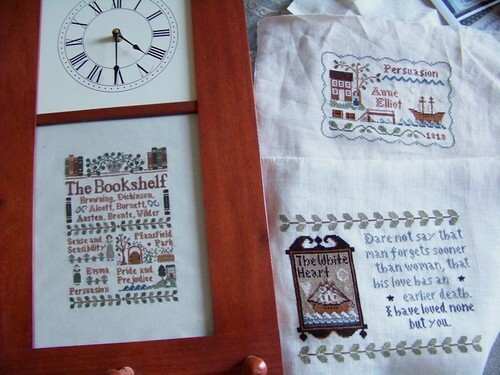 The challenge is mainly about reading and viewing….but I plan to include crafty things in my list as well. Actually I didn’t include any viewing since I will probably rewatch everything available at least once by 1/1/2010 anyway. 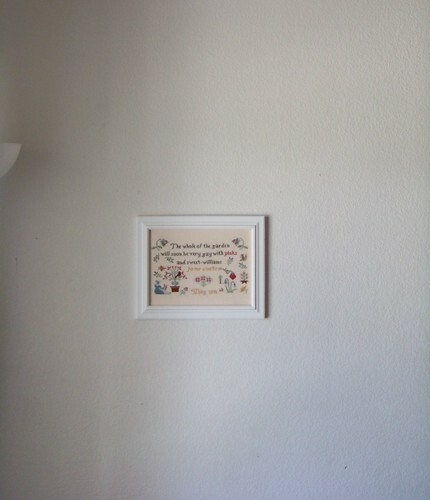 For the challenge I plan 1. to get at least four things framed and hung on my…. 2. 3. & 4. 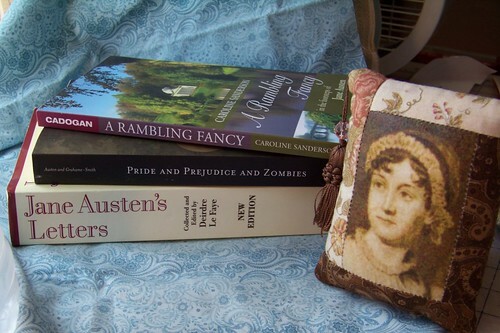 Read three Jane Austen-ish books…. and for 5. 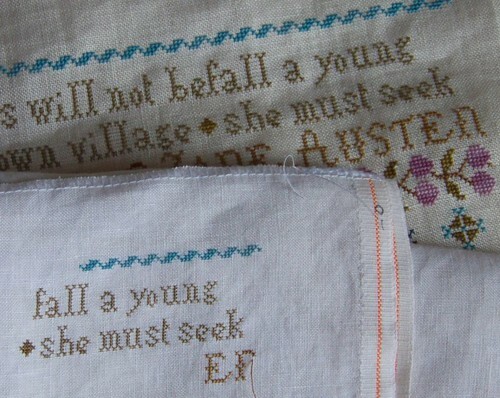 & 6. finish stitching two Jane Austen projects (at least). 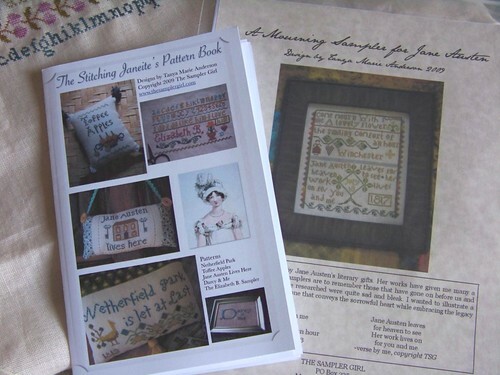 I’m already planning to include the challenge ‘prize’ to my next Amazon order so I’m only joining for the Austen Fellowship of the challenge but what fun!